Wentzville is a pretty little town in western St. Charles County, Missouri. Visitors to Wentzville enjoy the variety of hometown entertainment venues that include the National Horseshoe Pitcher’s Association Museum and the Wentzville Progress Park Recreation Center. Wentzville is home to about 30,000 residents and includes gorgeous historic houses and a pretty Main Street. Wentzville is also a great place to be when you have a dental emergency. A large selection of local general dentists, dental surgeons, periodontists, and endodontists who are standing to handle your dental problem. The emergencydentistsusa.com website is a great place to being and end that search for a new Wentzville emergency dentist. Just log onto our website and view a comprehensive list of emergency dentists with office hours and services that suit your needs. Click on the dental office that interests you, and set up that first appointment. You can find information like services provided, insurances accepted, and driving directions right on the emergencydentistsusa.com. When finding a dentist requires a little more help, call our toll-free dentist finder hotline. Speak with a caring agent who is standing by to help you pick out a new dentist, set up that first appointment, and to offer you driving directions if you need them. Remember to bring your photo ID and dental insurance card with you to visit your new dentist. Arrive at least 15 minutes early so that you have plenty of time to fill out the new patient paperwork. A visit to Wentzville means plenty of outdoor fun at the Quail Ridge Park. You can also find a great emergency dentist if a dental emergency strikes. Scroll down to see some of our top dentists below. 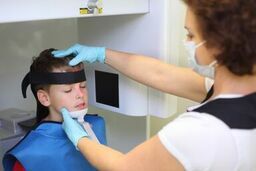 Description: Located on Pearce Boulevard in the heart of Wentzville, ActOn Dentistry offers caring services for all ages. This full-service dental clinic was voted the number one dental office in Wentzville. From restorative care to cosmetic procedures, ActOn Dentistry has you covered. Description: Two caring dentists and a friendly staff provide quality dental care for the whole family at Kraner Family Dentistry. From Smile Makeover Services to restorative care, this dental office offers services for the entire family. A fun No Cavity Club gives children the opportunity to enjoy their dental visits. Description: Offer warm and personalized care at prices that you can afford, My Crossroads Dentist is a dental clinic for the whole family. Minimally invasive dentistry with options for restorative care and cosmetic procedures makes this office a favorite in the Wentzville area. To kind dentists offer supportive care for anyone with a tooth problem. Tooth pain can ruin even a fun family vacation. If your tooth pain lasts for more than an hour or two, it is time to make an appointment to see your emergency dentist. Remember that tooth pain that begins with a fall or an accident requires a visit to the nearest hospital emergency room or urgent care center. Once a medical doctor clears you of any other injuries, you can head over to your Wentzville emergency dentist for treatment. The Missouri Dental Association’s website provides you with the information that you need to ensure that your new emergency dentist is properly licensed in the state of Missouri. Just log onto the website and enter your dentist’s name into the search box. View current licensing and credentials from the comfort of your own home. You can also find this information open for view at the dental office. It is important to select only a dentist who is properly licensed in the state of Missouri.